The shop has been family owned since 1961. Open for business upstairs over King Drug Store by Albert and Peggy Newsom Sr. We moved to the present location in 1967 when the King Post office moved to Main Street. I took over the business in 1989. 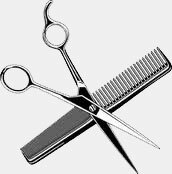 We are on our 5th generation of Hair Cuts and Styling for the Family. We cut the very young to the very young at heart and all in between. Our family has been serving the public since my father opened a service station and grocery in the 1930s. We are a people loving family. So if you would like to feel at home and would like a little pampering, come by or call ,our staff would be happy to pamper you.